Power trim operated by buttons on steering wheel. Ignition switch with safety lanyard. An exciting single seat tunnel hull catamaran, the Bobcat is the marine equivalent of a track day car, a great way having fun & going fast on the water, at reasonable cost. She would make an unusual addition to the fun toys carried on a super yacht. Of reinforced GRP she was built from moulds imported from the USA, then rigged and outfitted by Cougartek in Langkawi. The 30hp Mercury 2 stroke fitted gives speeds of 70kph / 45mph and the hull form is very forgiving with no tendency for excessive lift and instability. The Bobcat meets American Powerboat Association and UIM rules for anyone wishing to race. For safety the hulls are fitted with flotation bags and the seat moulding is also filled with flotation foam. 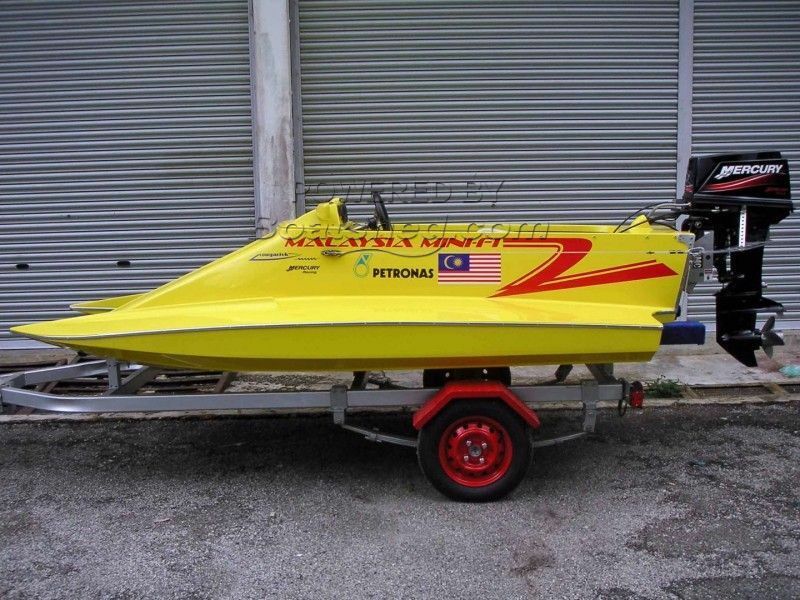 This Bobcat 3.3 M Racing Cat has been personally photographed and viewed by Alan Giles of Boatshed Phuket. Click here for contact details.